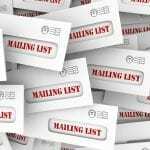 Before even designing or printing your mailers for the campaign, you need to identify your target audience. Who are you trying to draw in with your mailer? What kinds of offers appeal to them? Are they already users of your product or services? Having a clearly defined target audience makes the next steps easier, and your campaign more likely to succeed. Your message needs to be clearly displayed. Without a clear call to action for your potential customers, they may read your sent piece, but not be sure what the offer is. Without overburdening the receiver, you should be direct and upfront with your design. It should be attractive and distinct so that your audience takes a second or two to look specifically at your mailer. Just like with every marketing outreach effort, you need to be prepared for responses to your marketing. Whether that’s more people coming to your business location, calling in to ask about your services, or entering a giveaway contest, there should be a system in place to respond quickly and note whether or not people are responding to your mailer. Going along with the last part of tip # 3, you need to keep track of how successful each campaign is. It’s more than saying it did well or not. You need to look into why it went well or poorly. Is there anything you can change for the next time to make it better? Just because you did not get the responses you hoped for, does not mean you can’t improve in future campaigns. Treat both successful and less than successful endeavors as learning experiences. Everyone can use the help of experienced experts, but especially when just starting to get involved in direct mail marketing, it’s a good idea to contact your local direct mail provider. Usually they have trained specialists on staff that can help you coordinate your efforts and have the most effective engagement. If you’re looking for help setting up your next direct mail marketing campaign, the experts of RTC are ready and able to get your plan on track. With designers, mailing list options, and decades of experience at our disposal, you know you’ll get the best service available.